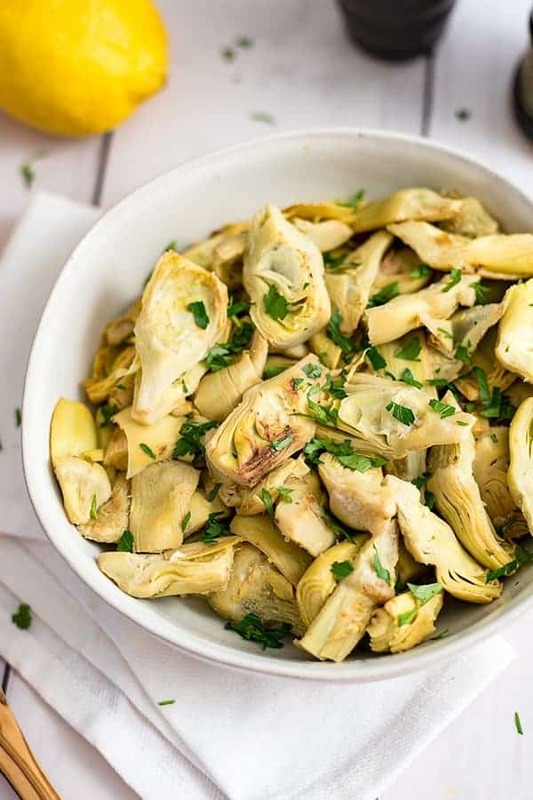 This simple lemon artichoke recipe is the perfect side dish for busy nights! Made with frozen artichoke hearts, this dish is ready in under 10 minutes and is so easy to make! Vegan, gluten free, grain free, paleo, whole30 complaint. 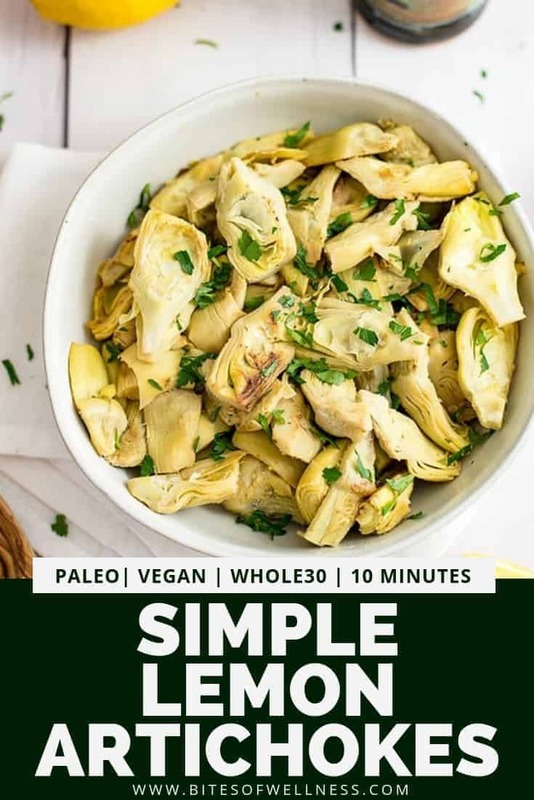 One of my favorite dishes to make when I’m feeling lazy but want something amazing is this lemon artichoke recipe with some simple salmon bites or 7 minute salmon. This lemon artichoke recipe actually reminds me of such a fun night with my girlfriends a few years ago. We threw a friends only dinner party and this dish was my contribution (because it’s that good and that simple). 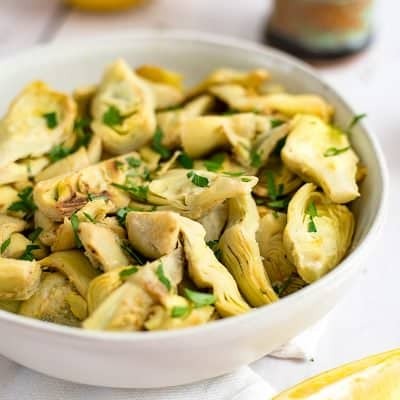 This lemon artichoke recipe is almost too simple to share with you. I use frozen artichoke hearts (from Trader Joe’s or Whole Foods), because let’s be honest, cooking artichokes from whole is overwhelming and a bit scary. But don’t let that scare you from enjoying artichokes any time of the week! 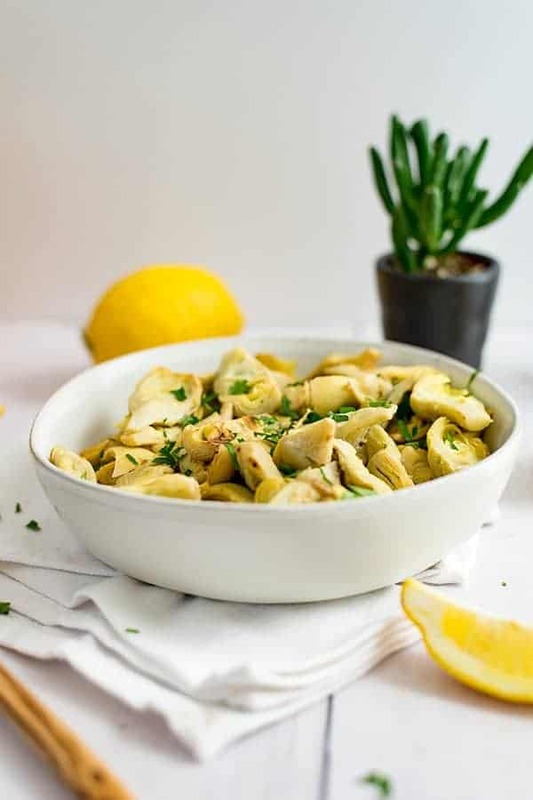 To make this lemon artichoke recipe, all you have to do is allow the artichokes to defrost, add lemon juice, salt, garlic powder, parsley (if you are feeling fancy) and some good quality olive oil. Seriously this dish is so simple. But don’t let the simplicity fool you! I think sometimes we believe that more is better. But artichokes are just made for a simple squeeze of lemon and just enough salt. This recipe is just like heaven after a long day! And they are great to make ahead of time and enjoy all week as well! If you are going to make a big batch of these for a party or get together, I highly recommend serving them with some simple dairy free arugula cashew pesto to take them up a notch! Talk about a match made in heaven! Oh I’m just drooling thinking of that combination! Artichokes boost the liver’s ability to produce bile. Bile is important for digestion and the break down of fats from your food. Without bile, you will have trouble digesting and assimilating fat and fat-soluble vitamins from your food into your cells and tissues. 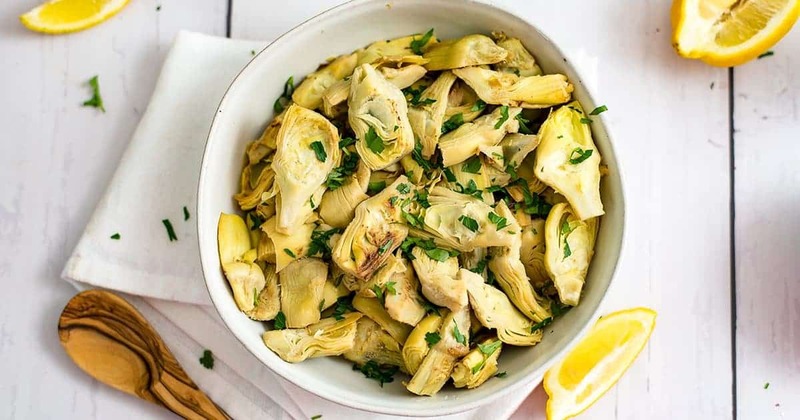 Artichoke hearts are a great source of prebiotic fiber. Prebiotic fiber is the food that feeds the probiotics in your system. Eating foods rich in prebiotics helps keep your digestion running smoothly! Artichokes are an excellent source of Vitamin C a powerful antioxidant that can help neutralize free radicals. Artichokes are a better source of Vitamin C than oranges! See how quickly this lemon artichoke recipe comes together in the video below. Don’t forget to leave a comment below if you have a question or tried the recipe! 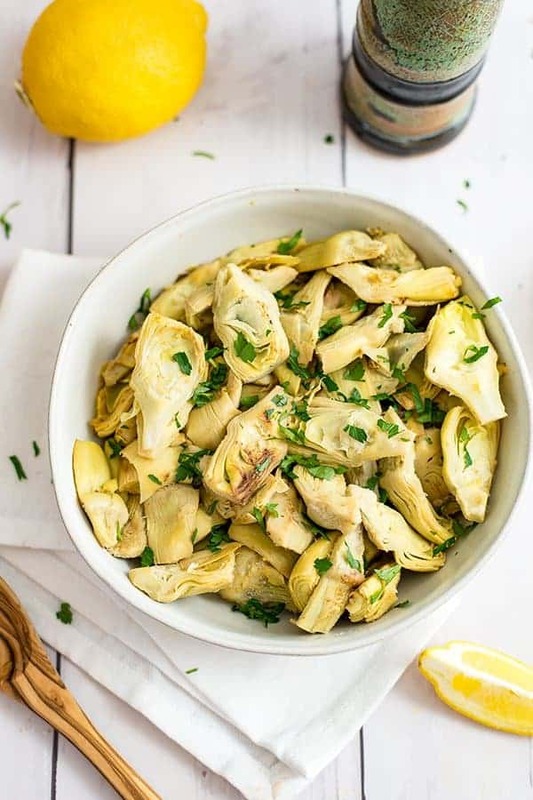 This simple lemon artichoke recipe is the perfect weeknight side dish! So easy to prepare and ready in about 10 minutes, this recipe is vegan, gluten free, grain free, paleo and Whole30 approved! Heat a cast iron skillet over medium heat until hot. Add 1 tbsp olive oil and the frozen artichoke hearts. Cover and cook 5-6 minutes over medium heat. Once the artichokes are defrosted, remove the lid and add the remaining tablespoon of olive oil, lemon juice, salt and garlic powder. Cook 2-3 minutes. Before serving stir in the chopped Italian parsley and serve hot. I just found out I love artichokes and loved this recipe.